Claim up to $475 welcoming bonus Play Now! Microgaming’s Halloween slot has been based on the long-running horror movie series that first terrified silver screens in 1978. And Michael Myers was the villainous antagonist responsible for striking fear into the hearts of moviegoers. His relentless thirst for violence was all the more frightening due to the white mask and boiler suit he wore. The slot design is not visually complex, with Halloween set on the front porch of a house. However, the slot interface itself has essentially been split in two. On the left, you will notice two reels with three symbols on each. On the right, meanwhile, there are three reels with four symbols on each. Microgaming has made this decision to accommodate the Wandering Reels feature, which will be explained below. You should also know that this more complex design does not prevent the slot from being compatible on mobile devices, with iOS and Android being the two top operating systems. When wagering on the Halloween slot, the coin size can begin at €0.01 and be increased up to €0.50. In terms of the coins, these can be staked from one up to eight. 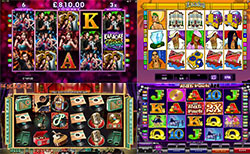 Minimum bets of €0.50 can be made, due to the 50 fixed paylines, and the maximum can be €200.00. • Trick or Treat Wheel Bonus: Three scattered wheels will kick-start a game that could yield a cash prize with a 10x multiplier. • Boogeyman Bonus: Triggered with the Boogeyman symbol, this feature can deliver cash prizes with rising multipliers. • Free spins: During the bonus wheel mini game, getting Laurie, Loomis, Annie, or Lynda to land will deliver nine free spins. • Wandering Reels: Watch out for the three-reel portion of the slot upping sticks and moving to one of the other positions on the screen. • Jumbo blocks: Wild symbols can be handy, but not so much as Jumbo Blocks filling up to 12 symbol positions. Halloween is pretty good in terms of visual standards, but the slot really excels for the special features and innovative interface. There is no shortage of perks to unlock when playing Halloween at Microgaming casinos. Captain Cooks Casino embraces the spirit of a legendary explorer to give players an engaging site that comes with numerous gaming options.